This project began as a simple display for my carved bookmarks. Halfway through, it began to take on an Art Deco feel and ended up looking like a 1930's movie theater bookcase. This is one of my few carvings that is not an original design. This was carved from a pattern in a woodcarving magazine. I included this carving because it is one of my favorites and hangs from my car mirror. It is approximately 5" tall and is carved from solid Maple. This carving was commissioned for the top of a graduation mace for Grantham University in Kansas City, Missouri. It is carved from solid maple and measures 2-3/4" tall, 1-3/4" across, 2" deep. The concept for Falling Leaves had been simmering in my head for many years. When I was invited by an art gallery for a fall exhibition, it seemed like the perfect time to create a piece that fit the season. Falling Leaves is comprised of 57 hand-carved leaves, acorns and lady bugs. All of the woods are their natural color. Hang'n Out was created as a donation to Friends of Homeless Animals (FOHA), a non-profit, no-kill animal shelter located in Northern Virginia. It was part of an auction with all of proceeds donated to FOHA. Hang'n Out was hand-carved from Catawba wood. I thought that was a fitting wood for a cat carving. It is hand painted and stands approximately 13" tall and 16" wide. It is dedicated to all of the shelter cats trying to find a permanent where they can "Hang Out". This was carved as a retirement gift for a good friend and fellow dog lover. At the time of her retirement, she and her husband had five dogs, four of them Dalmatians. It is carved from solid Cherry and hand-painted. My father was a huge Washington Redskins fan. I started creating this frame well in advance as a Christmas present for him. He passed away a couple years later and this frame reminds me of the great times we had talking sports and attending games. 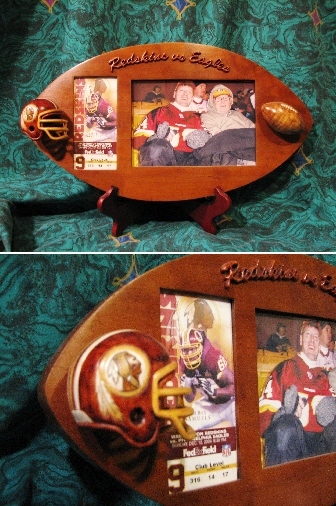 The frame is solid Cherry and the football and helmet are carved from solid Maple. Many times while on vacation, I work on a wood carving project. This was a project I selected for a hiking trip my wife and I took to Alaska. I saw this pattern in a wood carving magazine and thought if fitting for the upcoming holidays. 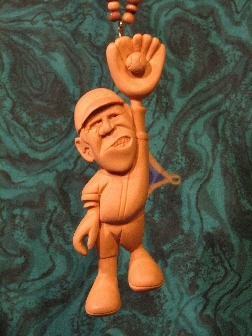 Carved from Basswood, this carving measures 10" tall. It is carved from an existing pattern. I had never carved a spoon and thought this would be an interesting holiday project. My good friend Jim Warwick's son, Alex, always admired a picture of an inlayed seamonster. He also has an affinity for seahorses. I decided to combine a seahorse with a dragon, resulting in a Sea Dragon. This will be inlayed on the headstock of an electric guitar. It is carved from solid Maple.